Blogger spontaneously turned off Comment Moderation on me sometime yesterday, so I wasn't aware that the post "Storage: An Editorial" had gotten any comments, much less so many excellent ones. If you're interested in the topic of archiving, you should read the comments. They're very good. —Preservation by copying has traditionally not been a good solution. Posterity wants originals, not copies. (The recent trend in libraries, for instance, of "guillotining" the spines off old books, digitizing the pages, and tossing out the original is not only wildly unsound from a conservation standpoint; from the perspective of posterity, it's outright vandalism.) This represents an opportunity when it comes to digital, since an exact copy of a relevant digital file is essentially a "second original." —Generally, analog deteriorates gradually, whereas digital failure is catstrophic, i.e., total. So the "perfect," copyable nature of the original digital information comes with a high price in terms of risk. —The value of keeping an archive together somewhere, whether it's a virtual or a physical location, incurs a variant of the same risk: in a catastrophic event (house fire, hard drive failure) you lose everything. I've long been an outspoken critic* of the Folger Shakespeare Library in Washington, D.C., because I think it's simply not good conservation practice to have so many Shakespeare First Folios bunched together in one place, especially inside the borders of such a high-value nuclear target. It would be much better, from posterity's point of view, to have two or three of those First Folios in each dozens of libraries all across North America. As was pointed out in the comments thread, an analog copy of a digital original makes very good sense from an archival standpoint. One commenter said that this was "film," but I think that's not quite right: it's prints. With the coming crop of pigment A3 printers from Epson, Canon, and HP, it may well be the case that your best bet in terms of archiving your work for longevity will be simply to make prints. *Nobody in the book world listens to me, of course, but hey, I'm out here speaking. Featured Comment by guacamole airlines: "Peter Krogh has some excellent strategies and advice about both where to store your digital images, and how to go about organizing your files in The DAM Book. I cannot recommend this book enough. It's the best 20 bucks I've spent on photography in years." I second the recommendation on The DAM Book. It has, for the first time (for me), presented a truly organized, sensible method of organizing your photo files in a manner that provides as much assurance of their short and long term survivability as can be reasonably expected, as well as the manner in which your photos can be accessed when you need them. Highly recommended! A long time ago I decided to print every digital image I thought was even remotely worth printing - even if it's just a 4x6. Now I've got stacks and stacks and stacks and stacks of 4x6's all over the place. I back up too. Two identical hard drives - one in my studio and one in a fire & water proof safe in my basement and gold CD & DVD discs of everything as well in the safe. Photographers learned long ago that redundancy is king. That's why I carry two camera bodies and two synch cords in my cases on every job. I could go on and on about this topic, as is probably obvious. Instead, I'll just make two final points, one about your original storage editorial, and one about this post. First: you ranted a bit about the assumption that the user is at fault when a problem occurs. Well, how many of you have ever read the full license that pops up whenever you install any piece of software? Read the fine print: legally, you *are* responsible for anything that happens as a result. According to the software manufacturers, you *are* at fault. These licenses are a problem. There have been attempts to pass legislation that will hold software companies at fault, but none have succeeded, as far as I know. My own customer base does not stand for that kind of legal chicanery: they expect, at the least, that if there's a serious problem, the problem's gonna get fixed, and someone's gonna get fired. As an analogy: by US banking regulations, if you are the victim of fraudulent transactions, you are responsible for only the first $50. The bank has to cover the rest. By UK banking regulations, any transaction that is committed in your name is automatically assumed to be real, and it is up to the consumer to *prove* that it was fraudulent. And the burden of proof is set rather high. The result? In the US, banks have spent quite a bit of time and money developing sophisticated technology and security practices. Since they bear the responsibility, they act responsibly. (Most of the difficulty with identity theft in the US comes from dealing with credit reporting agencies, not the banks.) In the UK, identity security and fraud detection is, to put it mildly, a joke. Without any reason to develop secure practices, they're left with exactly the situation we have in the software industry: anything that goes wrong is the user's fault. We (and I say this as a professional software developer) need to push for increased regulation of the software industry. It's the only way to put the burden of reliability back where it belongs. Second: actually, I'm tired, and I'm procrastinating when I should be getting things done. If I still feel that my point is worth making, I'll post it later. Sorry. The DAM Book is a real milestone work. I'd consider it mandatory reading for anyone that takes his/her digital photography seriously. Even if you don't follow all of Peter's suggestions it will certainly prompt you to give earnest consideration to adopting a full-cycle archive system that works for you. 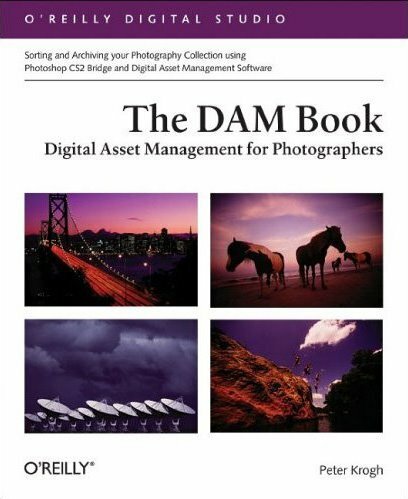 The DAM book is one of the ones that can be accessed via an online book account at Safari (http://safari.oreilly.com). I found the book so useful that I used some of my precious chapter download 'chits' to get a PDF file of every chapter. This way, I can print out (and mark up) ones that I wish to implement (or modify), and still have full-text search available, and with me on my laptop for reference. I can't praise the book enough, or the Safari online book service. The Safari service is allowing me to eventually ditch the hundred-plus board feet of technical books I have, and still manage to stay up-to-date.